My first impression of Harry was that he didn’t portray the age he was. Although being 89 he was mobile and self-dependent like that of someone in his early 70’s. He was mobile agile and still very alert. His demeanour was one of a focused but intriguing individual. To me he just seemed like an elderly gentleman that many people could relate to. You wouldn’t have guessed the life that he had lived. Asking if he needed any introduction he said to me “yes yes but be short I have a lot of important things say”. That small interaction summed him up adeptly. A man that deserves the respect his demeanour radiates and yet very focused on the solemn task he has. When Harry started talking an air of quiet erupted over the hall to which he was addressing. His voice had an air of authority and calming within it that allowed everyone to remain focused on his story and what he had to say. He kept the whole audience captivated throughout the speech often referring to the PowerPoint he had assembled, another testimony to this great man. It was also interesting to see all the documents that he had managed to save and allowed people to inspect. 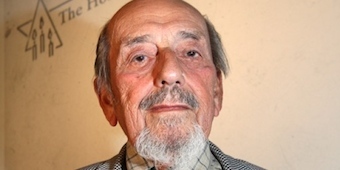 Harry’s account of what had happened to him during the prosecution of the Jewish population in Germany at the time of World War II was a breath of fresh air. The personal touch he brought to the subject breathed life into a subject that is usually just about figures and numbers. Ultimately he humanised the period of history, making it easier to relate to and draw similarities between how Harry lived and how I had grown up. This made it easier to understand how hard it was for him and made me fully realise the prosecution that the Jews were subjected to. Perhaps what was most humbling was how the persecution affected Harry himself. Being a child he was solely concerned and focused on what most would consider normal adolescent behaviour like ice-skating and swimming. When he was barred from doing these actions to him it appeared to be the end of the world yet in reality he couldn’t have been closer to the unfortunate truth. It wasn’t just the parents that were affected but also the children, and that is clearly conveyed in Harry’s presentation. It affected the whole population and children weren’t exempt from this. After finishing his speech he took a few questions and there was a stream of pupils that wanted to shake his hand and thank him for his incredible story about his journey through life. We proceeded to have lunch with this incredible man and he captivated our attention with what he had to say. At about 13:40 our time with Harry had come to an end and this incredible man got in his car and drove off, not home but to watch Tottenham play in the Europa League. In Harry we met a man that was understanding of his past life but didn’t allow it to interfere in the here and now and he embraced life in every form.